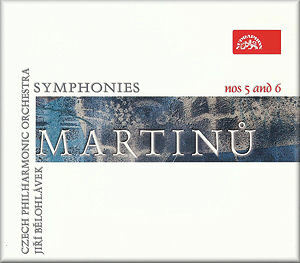 We can no longer complain about any lack of availability with the symphonies of Bohuslav Martinu. Starting with the same coupling of works from Karel Ancerl in distinguished mono, my own early reference was long the complete set conducted by Vaclav Neumann, since supplemented by the Chandos box with Bryden Thomson. I’ve toyed with the set on BIS with Neeme Järvi but never warmed to it in quite the same way as some critics, though if there were no others on the planet I could quite happily live with them. Vaclav Neumann’s old Supraphon recordings are still lovely, but returning to them after hearing all the detail given by more recent releases and their sound really does put them out of any serious running. The rather generalised sound-picture puts the winds very far back, and we miss out on far too much of Martinu’s colourful spectrum of orchestration. Put simply, I would almost give this new Supraphon release straight ‘A’s and then give myself a hard time trying to write a non-critical review, which is more difficult than it seems. For a start the recording is magnificent, full of rich and sparkly detail, Martinu’s nervy piano in the Symphony No.5 clear but not over-present, percussion needle-sharp but well balanced. The second Larghetto movement seems to embark at a lower tempo than I’ve been used to, but a comparison of timings shows no anomalies, and the Martinu ‘clock’ ticks with unerring accuracy through the movement with Belohlávek. To be honest, listening ‘blind’ for the first time, without having looked at the label properly, I hadn’t realised that this recording of the Symphony No.5 is in fact live, and the applause at the end was something of a surprise. It’s a shame that the first thing you hear is some lady shouting what sounds like ‘Jawohl!’, but I can’t blame the audience for their enthusiasm. Listening more carefully there are one or two moments which provide ‘live’ clues. In the first movement of Symphony No.5 we get a bum note from one of the flutes at 1:51, and the piano gets ahead of the tempo at around 7:18 threatening to make the whole thing fall apart – acoustic clues are as important to the ensemble as the conductor’s baton in this kind of music. He’ll have been buried in his part and not looking properly. There’s also a bum intonation from the oboe at 10:37 in the final Allegro. These are all very minor points, and as I say, you’d be hard put to tell it was live just from the recording, there being no audience noise as far as I can tell, just the inspirational fizz of the premier Czech orchestra performing a work which has long been part of its DNA. The Symphony No.5 was written in a time of optimism for Martinu. The war had ended, his career was very much on the ascendant, and while the music isn’t overburdened with ‘happy valley’ joyfulness you sense the feeling of a creative wellspring both through the music and in this moving performance. The Symphony No.6 on the other hand, written five years or so later, came to life slowly, under clouds of injury, illness and frustration about continued exile from Czechoslovakia. Unusually for Martinu the orchestration lacks a piano, though he had originally planned to use three. The sound, while still full of typical Martinu fingerprints of wind ensemble writing, is darker and stormier than many earlier works, and this brooding weight is felt to full effect in one of the most powerful recordings of the opening Lento-Allegro I know. It’s a shame that the tempo flags a little during the violin solo at about 06:00, but this is the only very minor blip in an otherwise magnificent performance. Moving on, the Poco allegro commences forcefully indeed, the strings and subsequent reed wind oscillations sounding more like a swarm of fearfully menacing insects than I’ve heard before. There are plenty of goose-bump moments in this movement which hadn’t had so much impact on me before hearing this recording. The string glissandi between figures 18 and 19 are brought out impressively for instance, and the study march-like rhythms and brass progressions have a vice like grip, moving to absolute tenderness, and providing the beautiful Lento opening of the final movement with a perfect context. These Supraphon discs are presented in a conventional jewel case, but with a tightly fitting cardboard sleeve which can be hard to manage when new. Reviewer’s tip of the day: take another jewel case, fit it carefully behind the one in the sleeve and push it through, one against the other – leaning the second case against your chest, or any other non-slippery surface. If, like me, you already have big wobbly piles of Martinu symphonies from which to choose, you may be reluctant to invest in still more Martinu symphonies. I would however say that these recordings are some of the best I have ever heard. Bryden Thomson is very good in his Chandos set, but it has to be said that the national ‘sound’ of the Czech Philharmonic Orchestra is hard to beat in this music, and here they are at their vibrant best. I lament the global homogenisation of orchestral timbre, and the vibrato we used to hear from the Czech horns is no longer much in evidence on this recording. The wind sound is gorgeously penetrating however, and the big Rudolfinum acoustic seems made to give these symphonies their ideal environment. I’ll be looking out for the other albums in this set, but for now taking our leave of Martinu in the final minute of this Symphony No.6 was never so hard – one of the most moving farewells ever.